Our 11 oz. MESH Banner With Liner is a reinforced banner material manufactured with polyester support cloth and coated with PVC. It is engineered to achieve approximately 40% air-flow through while still maintaining excellent printability.The liner makes the printing process easier by preventing ink spray through and helping the media to feed easily through the printer. After printing, the lining is easily removed for a clean finish.This 500X1000 Denier product is best used for applications that will expose outdoor mesh banners to high winds. 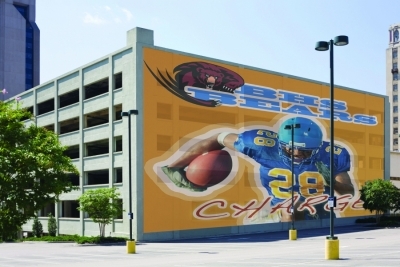 Other uses of this mesh banner material include building wraps, TV backdrops, or projects when a "see through" effect is required. Top Value Fabrics offers a full line of indoor or outdoor print media sign and banner material in various weights and widths for your special project. For more information, call today or view our full line of Digital and Screen Printable Banner Media.